Rick Reilly of ESPN recently wrote an article titled “The Jersey Rules” that, sorry to disappoint, has no mention of Snookie or The Situation, but rather lists a set of rules to live by when it comes to sports fans donning their favorite player’s game jersey. Since I am a fan of Reilly’s writing, I feel like I won’t come across as being a “hater” if I put him in his place on this one and explain why the article was dead wrong. First of all the article was meant to be funny…not really his strong suit if you ask me. He’s a very talented writer but he’s not exactly Bill Simmons when it comes to the satirical wit category. Nor is he Bill Simmons when it comes to on-screen appearances (thankfully). Nonetheless, his poor attempt at mocking “Joe Fan” who rocks a replica jersey so he can show off his team allegiances illustrates to me just how far removed he is from actually being “Joe Fan”. You’d think a guy who started off as a football beat writer only to have one of the most successful sports columns in the most notable sports magazine on the planet (Sports Illustrated), not to mention a show named Homecoming, would remember to stick to his roots a little more. Apparently having a co-writer credit of the smash-hit Leatherheads wasn’t enough to knock him down a peg (or two, or three…dozen). Seriously I think he could have written a better movie if it was just Ben Stein sitting on camera reading Reilly’s 25 years worth of columns. But instead he gets an even cushier gig writing a new column for ESPN, for all of 2 seconds, before parlaying that into the pinnacle of sports-writing…not actually being a writer anymore and turning into yet another talking head/annoyance for ESPN. The point is that he is the last person that should ever create rules for when it is or isn’t ok to sport a jersey. Someone hobnobbing with Jim from The Office and starring in beer commercials with super models shouldn’t be the guy to set the barometer for what’s appropriate fan behavior. Instead, let a true fan who doesn’t sit in private boxes or blabber away on ESPN (yet) be the guy who makes this distinction. 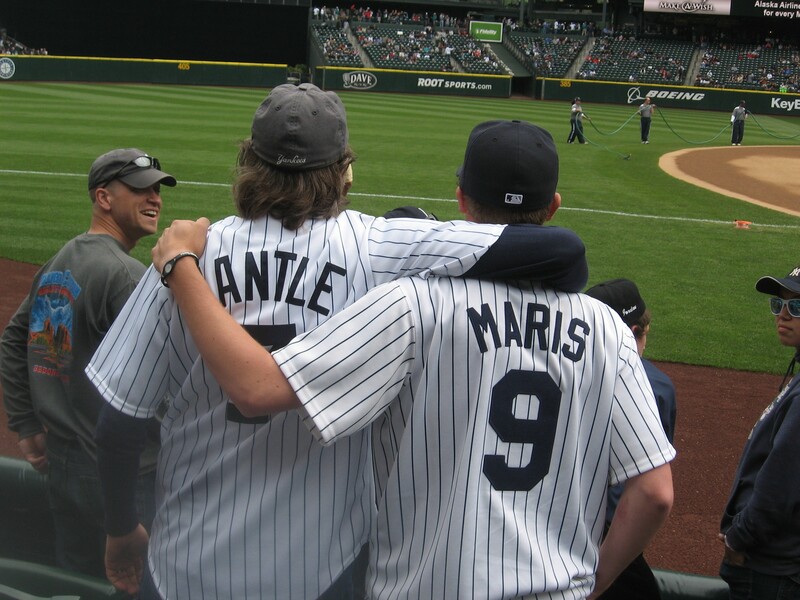 It’s time for The Movie Mind’s Rules for Wearing a Jersey. RULE #1 (The Seniority Rule): There is no age limit to wearing a jersey. The only age-related rule is that you cannot wear a jersey of someone who is younger than you. There’s a reason old guys wanted Brett Farve to hang around some more. A 38-year old wearing the jersey of a kid who just got drafted and could be his son is kind of weird, I have to say. However, there’s something to be said of still “looking up” to your elders. A 40-year old wearing a Warren Moon jersey back in 1999 would be acceptable because he could still say, “I used to watch this guy when I was a kid!”. RULE #1-Sec. 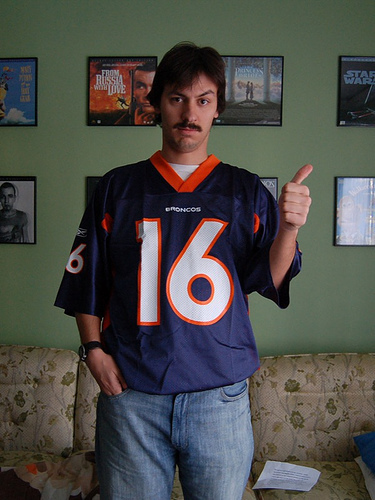 A (The Exception to The Seniority Rule): Under no circumstances, whatsoever, is it ok to wear the jersey of a kicker. EVER. This comes into play frequently because for the old guys, sometimes they might have no other choice than to rock the jersey of a 60-year old Morton Anderson. Sorry old dudes, that’s the time when you can’t where jerseys anymore. RULE #1-Sec. A-Rev.i (The Addendum to The Exception to The Seniority Rule): The ONLY circumstance where it is ok to wear a jersey of someone younger than you is when that player is retired. We can respect stars that take early exits from the game ie. Jim Brown, Barry Sanders, Yao Ming -wait, what? If you happen to be old enough to have rooted for a guy younger than you that is now retired, by all means it is ok to rep his jersey. Why this exception you ask? Because there’s the automatic “nostalgic factor” coming into play when a guy is retired. Plus, it reminds the kiddies these days not to forget about the old-timers who paved the way for them! What better better way to show it than with a classic John Starks #3 or Craig Biggio #7 (snickering). RULE #2 (The Home Rule): Here’s one that I think Reilly got completely wrong. 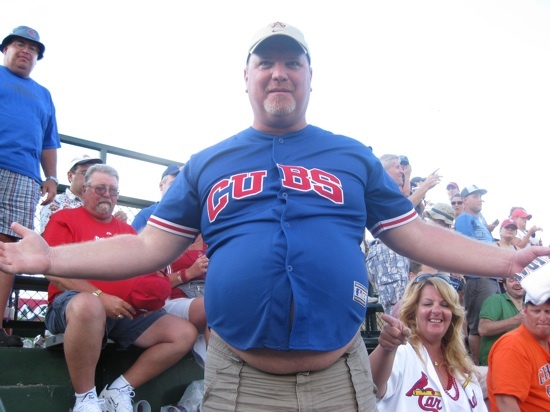 You can wear the jersey of anyone you desire inside the confines of your own home. Nobody, not family, guests, spouses, pets, or writers can tell you otherwise. It’s your house for crap sake and I guarantee you that a sports team jersey is by far the least offensive or hideous thing you could be seen wearing around your house at any given time. RULE #3 (The Traded Player Rule): Since we’ve addressed the retired player status, it’s time to look at the other jersey status that qualifies as a dead asset or diminishing return. In general, the rule is that you cannot wear the jersey of a player that has been traded away to another team. It’s kind of like wearing a golf shirt or using a pen with the logo of the company you were just fired from. I’m all for loyalty, but that’s a bit much. You wouldn’t still carry around pictures of your ex-wife in your wallet, would you? There are, however, a couple exceptions to this rule. See below. RULE #3-Sec. A (The Exceptions to The Traded Player Rule): If the player was a beloved team member who gave his heart to the team and fans only to be traded away after publicly expressing a strong desire to stay with the team and the move was ownership’s slap in his face, then it’s ok to wear their jersey. I call this one The Tino Martinez Exception. The other exception would be if the player has simply been traded too many damn times for any middle class citizen to be able to afford a new jersey every time he’s dealt. This one is known as The T.O./Jim Thome Rule. The final exception is that it’s ok to wear the jersey of a player who simply changes brand affiliations like in the situation of NASCAR. You know what-nevermind. It’s just not ok at all to wear NASCAR jerseys unless it’s for the fire-retardant benefits. RULE #4 (The Tebow Rule): You are permitted to wear the jerseys of any player, regardless of your age, location, or rooting interest, if the player happens to stand for something other than his own fame as an athlete. Maybe it’s a guy who cares about charity more than squeezing another million out of his contract (Warrick Dunn, Dikembe Mutumbo) or someone who is extremely involved in their community (Walter Payton) or is a symbol of hope (Dennis Byrd, Eric LeGrande). RULE #5 (The Design Rule): Jerseys may only be worn in actual team colors or designs. That means no more green Yankees or Red Sox jerseys with shamrocks on them. You’re either Irish or a fan that day…not both. You can wear special occasion jerseys for something like All-Star games, but it seems kind of silly that you would want to anyway. If you’re a Yanks fan you’ve either got the pinstripes or road grays, it’s your choice. If you don’t like the style options then start rooting for the Oregon Ducks. And sorry ladies, unless you’re Alyssa Milano and can claim that sleeping with half of Major League Baseball is “market research”, no pink jerseys for you either. It just tells us guys that you are high maintenance, not really a true fan, and care more about how the guys on the field look in tight pants than the game. RULE #6 (The Location Rule): Even with all of these other rules, there are still other “umbrella rules” which arch over them and must be followed even if all of the other qualifications are met. There are only certain places you can wear a jersey, EVER. If you are not in your home, at a game (and please only wear the jersey of one of the teams playing), at a sports bar (specifically to watch a game), or at your buddy’s place to watch a game, then you have zero good reasons to wear a jersey. If you happen to be playing in a beer league softball game, or flag football, or even pickup hoops…PLEASE do not wear your jersey. It will only open up the ridicule of how painfully removed you are from playing like that person whose name graces your back. RULE #7 (The Size Rule): Under NO circumstances are you to ever wear a jersey that is not at least 2 sizes too big for you. I don’t care how in shape you are or not, jerseys are meant to be over-sized, not skin tight. Unless you are 8 years old, leave the boys’ mediums to your girlfriend. RULE #8 (The Signature Rule): Never, at any time, should you wear a jersey that has been autographed. It’s one thing to support the team, it’s another to constantly look for a reason to tell the story about when you got your picture taken with Dan Marino at a card show for the 500th time. Signed memorabilia is meant to be in a display case, not on your body. RULE #9 (The Good Samaritan Rule): We all know we can recognize the guy who bought the jersey from the clearance rack at Marshall’s or TJ Maxx for $6.99. There’s no reason to point him out or make fun of him just because you happened to blow $299 for an “authentic” jersey on the team site. It doesn’t make you any better of a fan than him, nor are you any cooler than him. After all, you both still ARE wearing jerseys so how cool can you be in the first place? This also applies to any random, unknown, or unheralded player in that he should be thrilled to actually have a big enough fan to buy his jersey as opposed to acting like he’s too good for you. 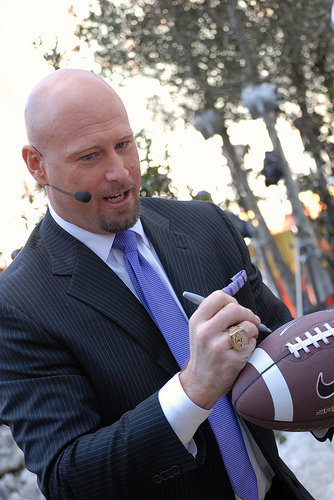 Next time you see an athlete who fits the “Trent Dilfer” bill, hand him one of your spare Best Buy Geek Squad work shirts and tell him it’s the least he can do to reciprocate the love! One category missed…what about the fictional sports character jersey (this is a movie website after all)…what are the rules governing the wearing of my #15 Hickory Jimmy Chitwood tank top, my Hanson Brothers Chiefs hockey sweater or my Kenny Powers uniform? Can I wear my full Oregon Pre track suit to take a pathetic jog (limp) around the neighborhood? And although the moviemind appears to be NY based and may not understand, another exception would be to wear a jersey to a super bowl championship parade, or rocking a Bruins jersey to get your picture taken with the Stanley Cup or any other celebration of champions! You should also be allowed to wear an AJ Burnett or John Lackey jersey at any time to be ironic and funny! Excellent point on the Movie jerseys…they can be worn at ANY time in any place. The more obscure the better. I do also think there’s something mocking about wearing a bum player’s jersey…but that also means you are somewhat supporting them by purchasing it! While I know the Movie Mind is not a hockey fan, he might have to become one this year with no NBA. With that in mind I think there are some addendum rules for particular sports that have been missed similar to the kicker rule (although tell a Raiders fan crazy enough to wear a Janakowski jersey not to wear one). 1. For hockey – you cannot wear an enforcers jersey unless you can actually enforce yourself. For example, you can never wear 99 or 66 in hockey. In basketball you better be able to throw down in your league to wear 23. Finally – you can never take a historic number from a player on another team and put it on a jersey of your team. Yes I have scene a Joe Montana Jets jersey. Now that I am parent there are those instances wear a child asks you to buy a jersey. If you own a dog and your kid wants a Vick jersey…the answer is no. You cannot let your child run around in a jersey of a complete loser who belongs in jail…yes I am looking at you Vick, Ray Lewis, 50% of NBA Players etc. Didn’t see any rules on wearing your teams jersey with your own name and number on the back? For example, a KC jersey with “The Movie Mind” on the back with #38? ?